This tea is brewed with medicinal herbs, cranberry and stevia to make the tea tasty and naturally sweet without calories or any need to add sugar or artificial sweetener. Cranberry Tea contains anti-inflammatory and antifungal medicinal herbs. Therefore, it is suitable for both those who suffer from urinary tract infection and those who suffer from fungal infection and candidiasis. Those who suffer from candidiasis are medically limited in their sugar consumption. Cranberry Tea is naturally sweet without sugar, which makes it a natural choice for them. Ingredients – Cranberry, Taraxacum Officinalis (Dendelion), Urtica (Stinging Nettle), Calendula Officinalis, Stevia Rebaudiana, Hibiscus, Althea Officinalis, Rubus Idaeus (Raspberry), Vacinium Myrtillus (Blackberry), Thymus Vulgaris, Polygonum Equistiforme. Thymus Vulgaris– Rich with Flavenoids and Phenols that are effective against infections, candidiasis, fungal infection and Candida. Flavenoids are anti-oxidant, anti-inflammatory and antiviral. Polygonum, Blackberry, Raspberry All contain Tannins, which are anti-inflammatory, antiviral and anti-oxidant (eliminates free radicals and prevents diseases and damage to the body cells). Althea Officinalis– Effective against urinary tract infection. Contains Flavenoids, Salicylic acid, Phenol acid and is a diuretic. Dandelion – Rich with Pectin, Phenols and Flavenoids. Contains Vitamins A, B, C, and Minerals: Iron (Fe), Magnesium, Sodium (Na), Kalium (K) and Zinc (Zn). Raspberry – Purifies the urinary system because it is a diuretic and anti-inflammatory. Urtica – Contains natural Vitamins: A, B, C, and Minerals: Iron (Fe), silica, Tannins. Diuretic as well as assists to get rid of Uric acid. DIRECTIONS: 2 - 3 cups a day, after meals. KOSHER - Press here to the kosher Certification. Signs of infection are the frequent need to pass water and a burning sensation when doing so. In women, this infection is caused by bacteria penetrating the bladder. In men, it is caused primarily by an enlargement of the prostate gland which does not allow urine to completely flow from the bladder. As a result of this, bacteria remain there for a longer time, they multiply and create inflammation and infection. Another reason for this problem is a weakening of the body’s natural immune system and a low level of white blood cells whose job it is to kill bacteria. An increase in the volume of drinking helps to prevent this problem by flushing out the bacteria and infections when passing urine. Drinking unsweetened acidic juices as well as drinking cranberry or blueberry juice, raises the level of acidity in the urine. Bacteria cannot survive in an acidic environment and thus they are destroyed, the infection is treated and the symptoms disappear. Other medicinal herbs that raise the level of acidity in the urinary tract and which kill bacteria are blueberry and raspberry leaves. Urinary tract infections, left untreated, could cause complications and harm the kidneys. Therefore, such infections must not be ignored. Initially, it can be treated by medicinal herbs such as blueberries and cranberries which are effective in treating the infection and can prevent its recurrence. Should the infection remain, then a physician should be consulted and antibiotic treatment added. “Cranberry Tea - Nufar” and “Cranberries - Nufar” in capsules. The capsules contain: Cranberries, blueberry leaves, raspberry leaves, Vitamin C, Soya protein and Opuntia Ficus (Indian fig). The cranberry tea contains:– Cranberry, Taraxacum Officinalis (Dendelion), Urtica (Stinging Nettle), Calendula Officinalis, Stevia Rebaudiana, Hibiscus, Althea Officinalis, Rubus Idaeus (Raspberry), Vacinium Myrtillus (Blackberry), Thymus Vulgaris, Polygonum Equistiforme. Vitamin C in the capsules: Strengthens the body’s immune system which assists in fighting the bacteria causing infection. Furthermore, Vitamin C raises the level of acidity in the bladder and prevents bacteria from clinging to the bladder’s internal walls. Cranberry & raspberry leaves: Increases the urine’s acidity - bacteria cannot live in this acidic environment and thus the infection is treated preventing its recurrence. Soya protein: Increases muscle tone, prevents a prolapsed uterus which makes passing urine more difficult thus causing urinary tract infections. Opuntia Ficus (Indian fig): Helps in treating an enlarged prostate gland in men, and thus reduces the risk of urinary tract infections. Furthermore, Opuntia Ficus flowers have antiseptic and anti-inflammatory properties which help in any treatment of infection. “Cranberries - Nufar” in capsules: 1-2 capsules per day. “Cranberry Tea - Nufar”: the recommended dose is 3 times per day after meals. 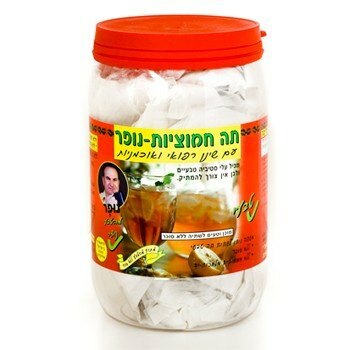 These may be purchased in health shops and pharmacies around Israel.